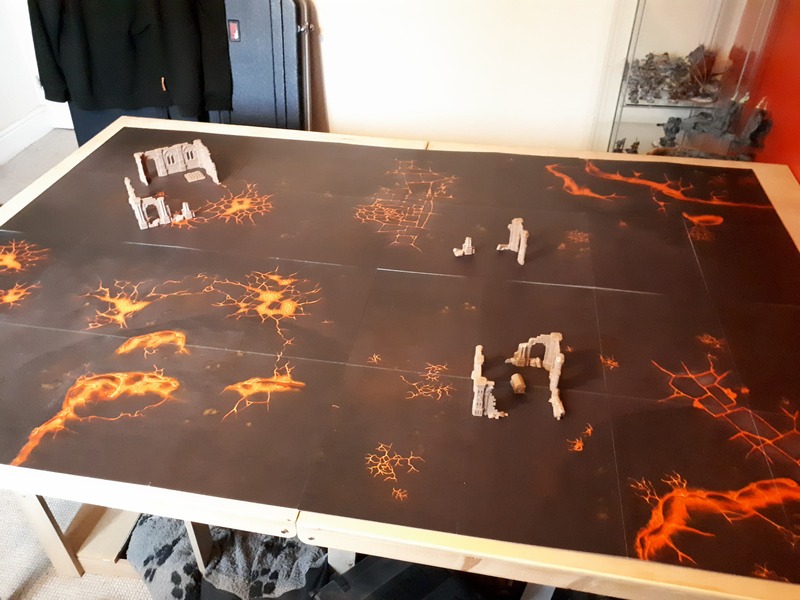 Having a kitted out game board/table space is no cheap endeavour. Anyone who knows their Shattered Domains from their Sector Imperialis boards can tell you that. However, Games Workshop have been on something of a streak lately with the latest scenery releases. We’re going to look at one today, the Realm of Battle: Blasted Hallowheart. The box comes with a handful of sprues that comprise the Azyrite Ruins. It’s 9 push-fit pieces with no glue necessary meaning you can get them together in no time. The detail on the ruins is quite simple yet intricate. It seems a safe bet that getting paint on these things would take no time at all for a tabletop standard. My particular highlight is the little chest that comes within. The temptation to slap that onto a 32mm base and use it as an objective marker is strong! Looking at the models and the box art, it says you can spray them Zandri Dust, wash with Agrax and then drybrush with Tyrant Skull. With a few selective washes of Athonian Camoshade and a dab of Nihilakh Oxide here and there, I reckon these’ll look the business! The amount you get is a little lacking considering the size of the board you’re getting. It covers a very small portion and whilst the ruins are modular for flexibility I wouldn’t say it’s near enough to fully populate a board. I’d advise very small games if you’re going with just the ruins in the box unless you have more terrain to hand. Though they are a nice way to bolster an existing amount of scenery. Now, for the core of the box. The gaming board that comes with it is composed of 4 fold-out card segments. The stuff isn’t flimsy at all though I’d still advise being careful with it. It’s somewhat dense and hardwearing but I’d not start throwing it around the room. The artwork on the board is particularly note-worthy. It’s crisp, has a great level of detail and meshes together nicely from segment to segment. Once you put some terrain pieces on there that tie the board together it really does look the part. It’s even double-sided, one side featuring a cluster of overgrown stonework and the other side is more of a volcanic wasteland. There’s a somewhat concerning issue with the latter, however. Most of the volcanic side is entirely black/very dark grey. My fear for this is that any scratches or marks are likely to be quite blatant. Of course, this comes down to how careful you are with your things. 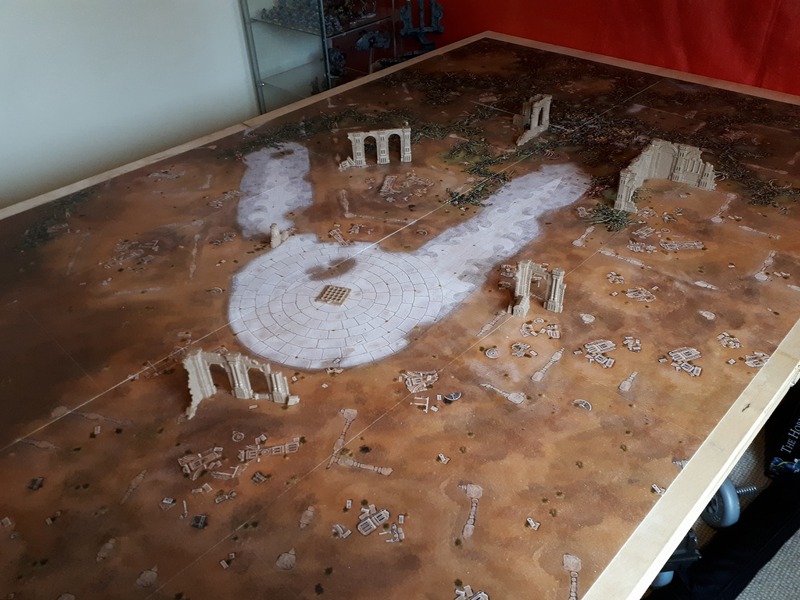 However, if you clip sprues near this board and a rogue chunk of plastic finds its way underneath the volcanic side, it’ll likely leave a mark. Any raised corners or edges also catch the light very easily against the black artwork. This can be noticeable but is definitely nothing major. Something else that is curious thing about the board is that it’s not quite 6ft by 4ft, the standard game table size. It ends up being 5.5ft x 3.7ft. I could assume this is due to packaging constraints and it’s by no means a deal-breaker. It’s just…so close. The final thing I want to mention is that a sheet of rules and missions comes in the box. This was something of an unexpected but welcome surprise. It’s a decent five pages, too! There’s simple scenery rules for the ruins themselves but also missions such as a gametype in which the chest must be defended or captured to attain victory. My only niggling issue is that rules for the scenery get a little murky. “When an enemy model targets a unit that is wholly within 1-inch of the Ruin…” Does that mean my five Blightkings need to be lined up against it, hugging a wall? What about a squad of ten Liberators? It feels like something you could house-rule. 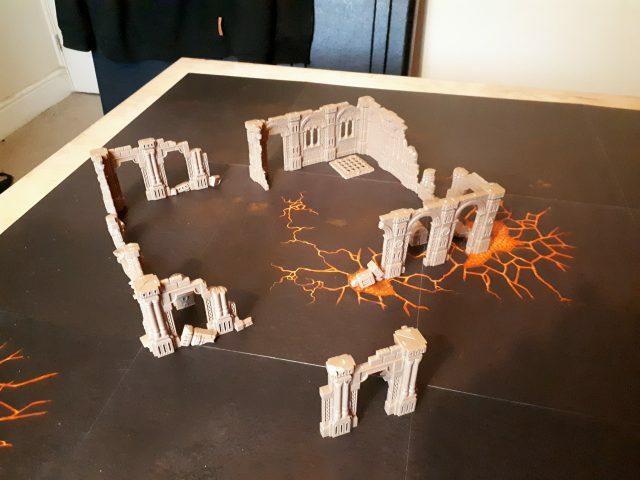 Alternatively, put some Azyrite Ruin sections on a bit of MDF or plasticard and you’ve got a little ruin that has easier to discern boundaries. Again, a very minor complaint. The ability to simply unfold the card and have a nice-looking surface ready to play on is the core-appeal of this product. Whereas with a full plastic Realm of Battle board it’s heavy, cumbersome and can be a hassle to unpack and pack away, let alone transport. However, you do get what you pay for that regard. Whilst the cardboard equivalent that is Blasted Hallowheart is attractive as well as quick and easy to set up, do not forget that it is cardboard at the end of the day. Cardboard can bend or crease and the darker side of the board may show wear and tear swiftly if you’re not particularly careful with it. For an economically savvy hobbyist who’s looking to have something of a pretty table to play games on, Basted Hallowheart seems a great deal. You get the very attractive board segments that serve the purpose without issue, so long as you take care of it. The ruins that come within are wonderfully exquisite and are accompanied with rules and a mission sheet which is always a bonus. It’s worth noting, though, that you do typically get what you pay for. This isn’t an all-in-one battlefield in a box containing all you need for your devastated 6ft by 4ft war-scape. However, it’s a great place to start!